Bernard "Bernie" Madoff, former Chairman of the NASDAQ stock exchange, started his own penny stock investment advisory firm in 1960 with $5000. In 2008, he was charged and pleaded guilty to defrauding investors in the amount of over $50 billion, running the largest Ponzi scheme on record over at least two decades. In early December 2008, at the height of the U.S. economic meltdown, people of every professional and social standard found themselves scrambling to liquidate funds across accounts. Many of Madoff's clients were no exception, but when his investors came calling, he couldn't answer their cash requests. Under mounting pressure Madoff came clean, admitting massive investment fraud affecting many people--including high-profile investors--and knocking Wall Street and the world back on its heels. 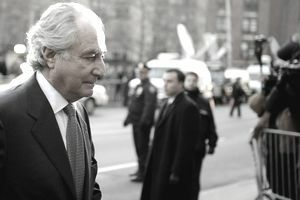 Madoff enjoyed an exemplary reputation in the financial community. His investors came from all walks of life and trusted him implicitly with their fund's management. Some of Madoff's more illustrious investors included a charitable organization funded by Steven Spielberg, actor Kevin Bacon and the owners of the New York Mets. Large banks and pension funds such as Spanish bank Banco Santander; HSBC; Royal Bank of Scotland; and Korea Teachers Pension were scammed by Madoff as well. Some of Madoff's individual investors ended up on the street, living out of cars and RVs. The Wall Street Journal developed a list of all Madoff's victims. Madoff pleaded guilty to charges of securities fraud, among others, and was sentenced to 150 years in a maximum-security prison. The courts are still sorting through Madoff's financial records in the wake of his arrest and indictment, trying to decide restitution and distribution to his investors with the money they can find. Still in prison, Madoff maintains that the big banks defrauded in his scheme were complicit. Madoff's two sons, Mark and Andrew, both worked in his firm but were isolated to a side of the business not directly connected with the Ponzi scheme Madoff was running. Both have been named in lawsuits and have been under investigation, but neither was named in criminal charges relative to the $50 billion Ponzi scheme. Two years to the day after Madoff was arrested for running a Ponzi scheme, his son Mark Madoff committed suicide in his New York City apartment building. He did not leave a suicide note, but both brothers were very bitter toward their father and had not spoken to either of their parents in two years. Ruth Madoff, Bernard's wife, settled with the feds for $2.5 million and quit seeing Madoff in prison in order to reconcile with her son, Andrew. She revealed that she and Bernie made a suicide pact before he revealed his Ponzi scheme but didn't go through with it. Andrew Madoff's fiancee, Catherine Hooper, has written a book in cooperation with Laurie Sandell called "Truth and Consequences: Life in the Madoff Family." Andrew and Ruth Madoff will not profit from the book, but Andrew's fiancee will. Many victims of the Madoff Ponzi scheme are angry about this and feel the profits should go to compensate victims. The revelation of Madoff's Ponzi scheme set off the discovery of numerous additional financial misappropriations, but no subsequent swindle approached the size and scope of the Madoff Ponzi scheme.